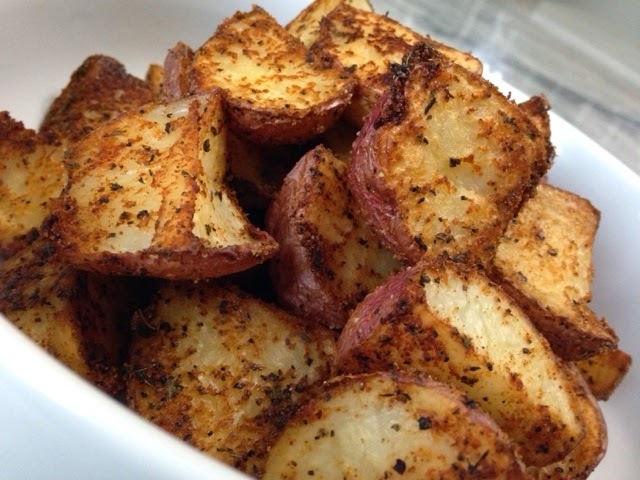 To serve alongside my Cajun shrimp, I made these Cajun roasted [red] potatoes. I cut my red potatoes into small pieces [first I halved them, then quartered each half]. 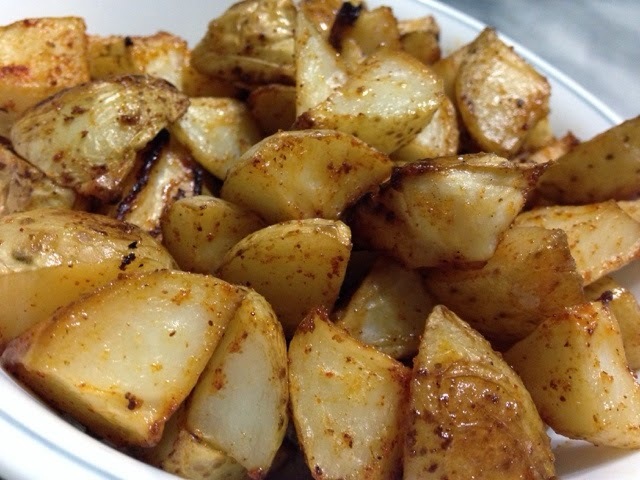 I transferred all of the potatoes onto a foil-lined baking sheet, Next, I sprayed the potatoes with non-stick cooking spray before I seasoned the potatoes with black pepper, garlic powder, salt, onion powder, paprika, and of course Cajun seasoning. I baked it in a preheated 350 degree oven for 50 minutes all together. For the first half of the baking time, I had all the potatoes facing skin side up. For the second half? Skin side down. 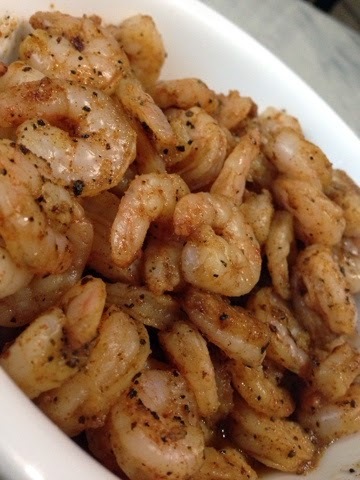 I seasoned my shrimp with black pepper, garlic powder, paprika, Cajun seasoning and lemon juice. In a preheated 400 degree oven, I baked my shrimp for about 12 minutes. I served these alongside my Cajun roasted [red] potatoes. This past Sunday, I attended a janaza prayer [AKA salat-ul-janaza] for the father of one of our family doctor’s. Janaza prayers are the Islamic funeral prayers. Now I’ve attended quite a few funeral prayers. My first memory of attending one, unfortunately, [for a close family member] is back in 2001 for my 15 month old baby girl cousin Aliya. And before today, that was the most packed one I remember attending. The day of Aliya’s was also jummah-tul-wida so the crowd was a combination of family/friends and mere Muslim strangers that happened to be at the mosque for the holiday. This past Sunday, at the very same mosque, subhanAllah, there was the same large crowd, if not an even larger crowd. All the side rooms, the offices, and the library were packed with people besides the main congregational prayer area, yet there was still not enough room to accommodate everyone– there were still people outside the mosque. It hasn’t left my mind since. I had never met the person who passed away. It speaks volumes to me, however, to see the community turnout for this man’s funeral prayers. Including several imams from local mosques. It says so much about this man’s character and how he must have lived. We so often let the daily mundanes get the better of us and worry about the frivolous tangible possessions. We focus so much on the now– the this very moment in our lives. We worry about the past. Janazas are just the very real throw-in-your-face reminder that we all need more often that everyone must die one day. It should make you refocus and think about what is important in your life, and let go of the trivial nonsense. It should make you want to better yourself and your iman [faith]. It’s inevitable that we must all die one day. But what do you want to be remembered for? Are you maximizing your good deeds while working on improving yourself in the areas you aren’t too happy with? Are you leaving a lasting impression? Is it a good one? Are you making a difference with your life? For my parents’ 30th anniversary last night, for the dessert, I made this individual sized chocolate chip cookie [mini pie sort of things] that I served with french vanilla ice cream. 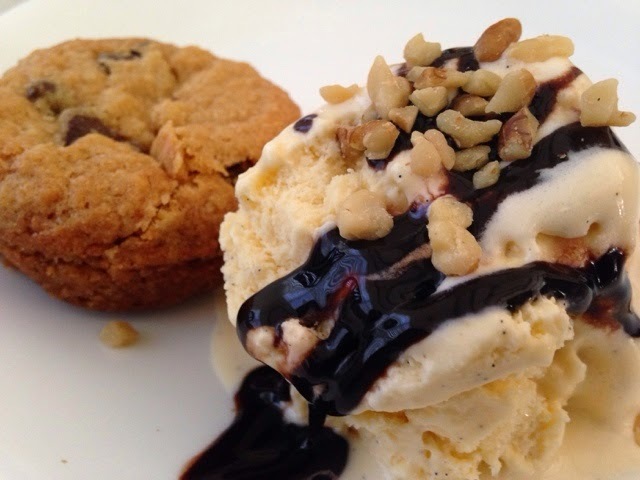 A la mode means to be served with a scoop of ice cream. Click here for my homemade chocolate chip cookie recipe. I baked them in a muffin pan, in a preheated 325 degree oven for about 15 minutes. To garnish? Drizzle chocolate syrup or hot fudge on top followed by a sprinkle of walnuts. Click here to see the recipe for the chicken and roasted potatoes if you missed it yesterday. Today marks my parents 30th wedding anniversary! 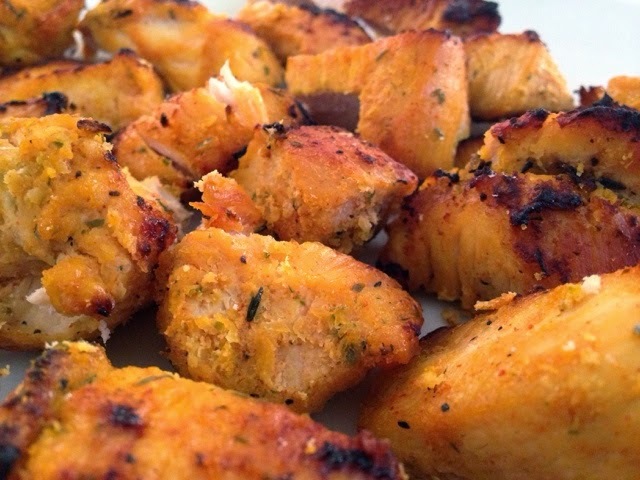 is pretty much cubed chicken that is marinated, skewered and then grilled. I marinated the boneless chicken cubes with salt, black pepper, chili powder, paprika, cayenne pepper, garlic powder, ginger powder, onion powder, thyme, ground mustard, lemon juice, yogurt, and raw papaya [to help tenderize the meat]. Let the marinated chicken sit for a few hours. Set your broiler on high. Skewer your chicken. Put it under the broiler for about 15 minutes. Take it out, flip them over, and set back under the broiler for another 7-10 minutes. Broiling Tip: Whenever you use the broiler feature in the oven, make sure you leave the oven door open a little bit. 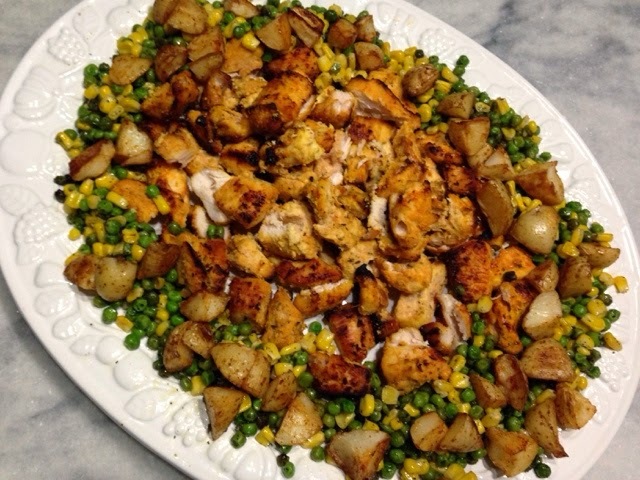 I served the chicken alongside a combination of corn, peas, and roasted potatoes. For the roasted potatoes: I took small gold potatoes– cut each in half, and then each half into quarters (small pieces– you get the picture). I seasoned them with salt, black pepper, garlic powder, paprika, onion powder, and chipotle powder. Drizzled them with olive oil. Mix well. Bake in a preheated 400 degree oven for about 20-25 minutes. For dessert, I made chocolate chip cookie a la mode. A la mode means to be served with a scoop of ice cream. I’ll try and post that tomorrow: easy and delicious as usual. When my brother Ayaz emailed me a link to a tweet by our local newspaper asking for our favorite pizza pie recipes, I let it sit in my email box for a few days before going, “what the heck, I’ll share my Bubble-up Pizza and my favorite pizza recipe. I figured that would be it, a RT (retweet on twitter) at the most. Surprisingly, shortly thereafter, I got an email from the Social Media Editor affiliated with the newspaper. She asked me whether I would mind sharing some of my recipes on a post they would be featuring for Pi Day (today), how I started cooking, and why I post my recipes on my blog amongst a few other things. 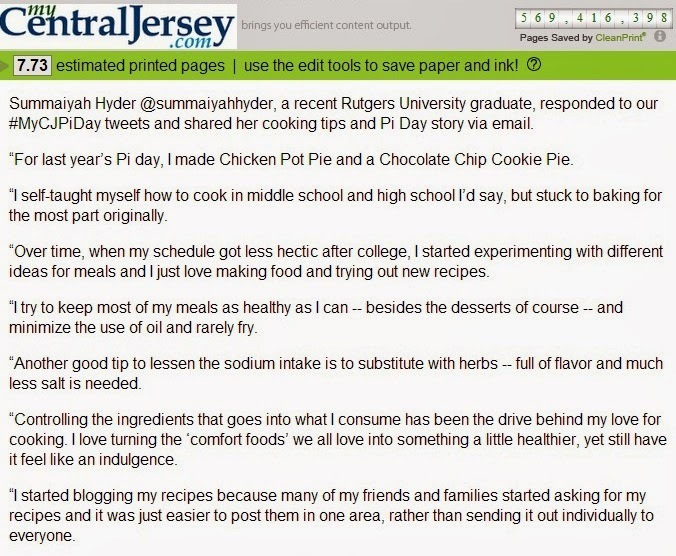 As a result, my Pi Day recipes from last year (Chicken Pot Pie and a Chocolate Chip Cookie Pie) are part of their Pi Day feature in their newspaper’s website today [alongside a link to my “What’s for Dinner” section of the blog! Two weeks ago, on February 21st, I had my first [and God-willing last] surgery. Thyroid surgery to be precise. It’s one of the toughest and scariest things, if not the toughest and scariest thing, I have [physically] faced [as of yet] in my life. It’s been a hard two weeks of recovery thus far but, alhumdulillah, slowly getting better each day. Which wouldn’t be possible without the help of Ami. The first week post-op I wasn’t supposed to move my neck left/right/anywhere and I couldn’t lay down. Yes, I stayed sitting for a week straight and that’s how I “slept”. Ami helped me around the clock, which I truly appreciate. Night eight, I figured I’d attempt to sleep on my side. In my sleep, however, I decided to be rebellious and ended up sleeping on my stomach. Not a fun way to wake up: sore and painful. Thyroid issues are becoming more and more common, but before my surgery I didn’t know anyone who had to have surgery because of one. I still don’t know anyone personally actually. Just that, it’s no fun. As a result of said surgery: I, now, have a [not so] lovely scar that will remain for the rest of my days on my neck as a reminder. But the more optimistic me is going to look at it as a reminder of what I overcame in the process.